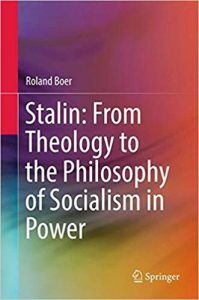 In Roland Boer’s Stalin: From Theology To The Philosophy Of Socialism In Power, Boer attempts to address the thoughts and writings of the ‘black legend’ on the grounds that: a) Stalin is a unique and significant thinker who should not be tossed out of the Marxist canon, and that b) that Stalin’s thought and framework permeates (what Boer labels as) the ‘Socialism in Power’ in present-day China. The angle in which Boer does this is quite unique and different to what most would expect. By utilizing Christian Theology, Boer is able to synthesize a new understanding of the thoughts and writings of Stalin that is both comprehensive and rigorous. It is here that I would like to claim, ‘If you want to understand Stalin and the U.S.S.R. in which he presided over, then there is no better book.’ But this recommendation comes with the caveat that the reader must understand the political leanings and goals of Boer before this undertaking. Boer, expecting “…the knee-jerk reactions, that are produced by the cypher of ‘Stalin’” (v) attempts to maintain a ‘balanced’ position between the veneration and demonization of Stalin by only analyzing his published texts. Boer refuses (and rightly so) to focus on the archives to extract some lost secret of Stalin’s. But by only focusing on published writings, Boer’s account is heavy on the theory of Stalin, but unfortunately, light on the practice. To some degree one can understand why Boer took this route, with the bogus historical accounts of figures such as Robert Conquest, it is impossible to find neutral ground on which history was conducted. But by omitting or generalizing major historical events and especially the contents of the show trials, it is hard to believe if one were to read this book without any prior knowledge and extensive study into these areas one would leave with a ‘balanced’ view of the legacy of Stalin. This is a tough criticism to make, since Boer is careful not to directly venerate nor demonize Stalin, even going as far to write, “Throughout, I attempt not to take sides, but to understand” (xxii). But it is clear throughout the book that Boer has a pro-Marxist-Leninist leaning for ‘Socialism in Power’, which distorts his proposed balanced view. In the introduction and Chapter 1: “Stalin’s Bible,” Boer takes the reader through Stalin’s rigorous Theological training at the Tiflis Spiritual Seminary and shows how Theology is permeated throughout Stalin’s writings and thoughts. This part was immensely fascinating, and it is clear that Stalin’s works are ripe with Christian theology. “For if we have faith, faith in Lenin, even as small as a mustard seed, the revolution is ours. We can move mountains” (7). But soon after this Boer lays out what he considers a major theological underpinning of Stalin’s thought. Boer writes, “Marxism is also in one respect, a scriptural (that is, written) tradition” (13). Because of this, interpretation of texts is often the point of contention between almost all Marxist groups. After the death of Lenin, debates around the correct interpretation of his writings raged amongst the Bolshevik leaders. “For instance, in his extensive answers to questions at the end of his report on the Fourteenth Congress of 1925, Stalin engages in detail with Lenin in seeking to refute his opponents. Stalin’s tactic in these debates is to distinguish between Leninism and Trotskyism…” (14). Boer presents these debates in the Theological register by viewing Stalin as moving beyond adherence of the ‘letter’ (following the writings and thoughts of Lenin dogmatically) and instead interpreting the ‘spirit’ (looking at the material conditions on which adherence to the letter is ill-equipped to handle and to improvise). This is an interesting move by Boer who labels Trotsky and the rest of Stalin’s opposition as adherents to the letter, while Stalin himself is the sole interpreter of the Spirit of Lenin. What is of note is that after Mao’s death, the main architect of present-day China, Deng Xiaoping, used this same tactic with the writings of Mao to outmaneuver his political opponents in the Maoist opposition who gained their posts during the Cultural Revolution. This similarity should not be ignored and paints a counter-narrative that I will return to by the end of the review. But this is the first of many moves by Boer that pushes the reader towards his political leanings. In Chapter 2: “The Delay of Communism: Stalin and Proleptic Communism,” Boer shows that like the ‘delay of parousia’ (the delay of Christ’s return) created Theology for Christians, the ‘delay of Communism’ created for Stalin the theory for which to build Socialism upon. This chapter is enthralling because Stalin inadvertently creates a Hauntology in his stages theory with which Boer calls a ‘mythical communism.’ As Stalin develops the stage of Socialism (the strengthening and consolidation of the proletarian state), Communism in his writings gets pushed farther and farther back into the future into which it becomes an Althusserian last instance which may never come, like the Spectre of Communism that haunts Marx’s Europe, so too does the spectre of Communism haunt Stalin’s Socialism. In Chapter 3: “Babel versus Pentecost, or, the Dialectic of Linguistic Diversity,” Boer explains how Stalin follows a Pentecostal approach to his theory of a universal language. This chapter is absorbing and its clear that Stalin, when it came to his early writings on linguistics, thought very dialectically with the belief that a revolution will first create a diversity of languages and then go on to synthesize into a new universal language. A very intriguing point is made near the end of the book that ties into this chapter of how; “this point may have been rediscovered much later in the very different context of the challenge of ‘master narratives’ characteristic of postmodern debates, where the liberal celebration of difference and tolerance led to no position at all, while the determination of a totalizing explanation produces whole new levels of diversity” (188). Although this may be giving a little to much credence to Stalin, it is an interesting take nonetheless. But it is in Chapter 5: “Party and People, or, Transcendence and Immanence,” that Boer makes a comparison that after the chapter on the Red Terror and the Gulags just seems dishonest. “Trotsky with his experience in building the red army, was not averse to strong-arm tactics…Trotsky according to Stalin’s depiction, is in favour of the primacy of coercion, although this does not preclude persuasion. By contrast, Stalin prefers the primacy of persuasion, in which coercion is subordinate to and an auxiliary of persuasion” (132-133). This idea of Trotsky mostly being in favor of coercion, while Stalin being mostly in favor of persuasion is a wild claim, that looking at the history of the two men seems to run counter to what Boer is stating here, and is another example of him trying to push the reader towards his political leanings. But there is one theological underpinning that Boer seems to miss entirely that may explain why the thoughts and framework of Stalin are present in modern-day China. In Alain Badiou’s Saint Paul: The Foundation of Universalism (a book Boer quotes) Badiou writes about the struggle that took place between the militants of the Christ-event on whether its truth would remain universal and follow the Theology of Saint Paul, or be regionalized and follow the Theology of Saint Peter. Within both the Russian and Chinese Revolutionary Projects this very same struggle of Universalism vs. Regionalization between their militants occurred. In the Russian project this struggle was between Trotsky and Stalin (Permanent Revolution vs. Socialism In One Country), and in the Chinese project, it was between Mao and Deng Xiaoping (The Communist Road (Cultural Revolution) vs. The Capitalist Road (what became Socialism with Chinese characteristics)). To put Trotsky and Mao together as militants of the universal is no doubt going to make some uncomfortable, but that is how the universality of Communism works: by taking different forms of struggle and bringing together the most unlikely representatives of its truth. In conclusion, perhaps the reason Stalin’s framework resonates in present-day China is not some upward movement of the dialectic of ‘Socialism in Power’ as Boer would have his readers believe. But instead a regionalization of the Chinese event occurred (like the Russian event) and the Chinese Revolutionary Project no longer follows the universal project of Communism, but instead a regionalized project of State Socialism. After all, it is called Socialism with Chinese characteristics.